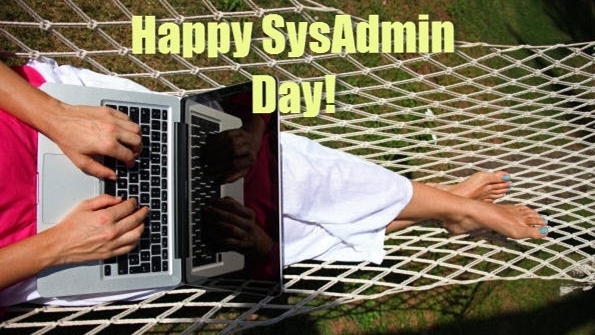 SysAdmin Day | System Administrator Appreciation Day | It's my life, you're just along for the ride! Friday, July 25, 2014, is the 15th annual System Administrator Appreciation Day. On this special international day, give your System Administrator something that shows that you truly appreciate their hard work and dedication. All day Friday, 24 hours, your own local time-zone. Consider all the daunting tasks and long hours weekends too. Let’s be honest, sometimes we don’t know our System Administrators as well as they know us. Remember this is one day to recognize your System Administrator for their workplace contributions and to promote professional excellence. Thank them for all the things they do for you and your business. via SysAdmin Day | System Administrator Appreciation Day. This entry was posted in Humor, Interesting, Tech, [ STR ]. Bookmark the permalink.